Some of the characters not liking each other. A deleted scene in which Zoidberg asks the others for money to bet on fishing with. Using 3D for the ocean was easier than drawing it. 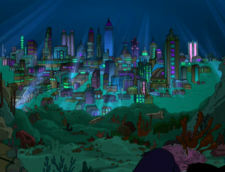 All the rooms inside the Planet Express ship. The origin of Umbriel's name. This page was last edited on 4 August 2012, at 04:43.